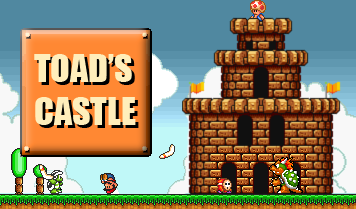 Toad’s Castle was started on June 25, 2004 as a successor to supertoad’s previous fan site, The Home of Mario. July 2007 was our most visited month with 2,605,215 hits and 46,779 unique visits. Q: Can I use something from your site on my own site? If you would like to use any of the original content please contact us first. We can usually make an agreement to trade content. Q: Can I submit something or help out? A: Absolutely! Use the easy content submission form on the contact page or the email address found on the same page. Q: What do you need most? A: Guides and reviews for new Mario games. Q: When will my submission be put on the site? A: Usually within a week. A: Sure! I am now using the Links Forum to manage all external links. Toad’s Castle is an unofficial fan site. It is in no way affiliated with Nintendo or any other related company. Mario, Luigi, Wario, and all related characters and games are copyright © Nintendo. Submitted works such as game guides and reviews are the property of their authors. Contact them for more information. By submitting any work, the author grants Toad’s Castle and its staff the right to post, edit, or use the work in any way without seeking further permission.